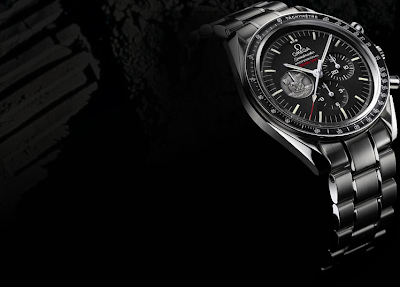 "The 40th Anniversary Limited Edition is powered by OMEGA’s calibre 1861, which shares its lineage with the calibre 321 used in the original Speedmaster Professional Moonwatch. The stainless steel case body is delivered with a stainless steel bracelet which has been upgraded to include OMEGA’s patented screw and pin system. The small seconds counter is a medallion which features an adaptation of Apollo 11’s famous mission patch. The watch’s hour, minute and the red-tipped chronograph seconds hands are coated with Super-LumiNova. On the dial, the legend 02:56 GMT – the exact time that Neil Armstrong made his “one small step” onto the Moon – is displayed in red. The dial is protected by Hesalite, the same robust, shatter-proof acrylic crystal found on the original Moonwatch. A small, distinctive OMEGA logo has been etched evocatively inside the Hesalite crystal. The Apollo 11 “Eagle” mission patch is stamped on the caseback along with the words, “THE FIRST WATCH WORN ON THE MOON”, the limited edition number (0000/7969), and “July 21, 1969”, the date Armstrong and Buzz Aldrin first stepped onto the moon’s surface."